Lakeshore Aviation is pleased to announce our newly-expanded Air Charter fleet, giving you more options for your personal and business travel needs. 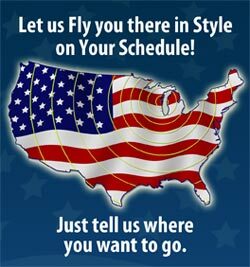 With the ability to fly directly from your local airport to over 3000 other small and large airports in the country, you can cut travel time dramatically. You don’t have any missed connections, lost luggage, or intrusive TSA screenings. You travel on your schedule, going where you want, when you want. Our fleet ranges from a light twin-engine piston Seneca, to a larger, pressurized Cessna 340 to a fast turboprop King Air C90. In addition, through our charter partners, we can get you just about anything else you need to handle your travel requirements. The premier aircraft in our fleet is a newly restored King Air C90 business Turboprop airplane, with seating for up to 7 passengers. This aircraft features the new fast, fuel-efficient GE H80 engines rated at 800 HP a side. It flies at nearly 300 MPH, high above the weather. It has brand new paint and leather interior, and the most modern glass panel color GPS technology for your comfort and safety. 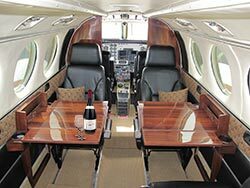 In addition we have our flagship Piper Seneca, perfect for short to mid-range trips for up to 3-4 passengers, and a beautiful Cessna 340A pressurized business class twin-engine airplane. With stunning new paint and beautiful leather seating for up to 5 passengers, you can travel in style for up to 4 hours at nearly 250 MPH. Call us for more information. View our Air Charter brochure here. 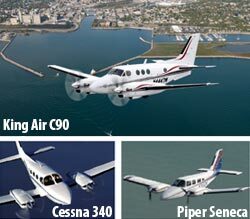 View our King-Air spec sheet here.